For many shoppers, meat is one of the most expensive items in their grocery cart. It was for me, too, until I discovered Zaycon Fresh through another blog and learned I could save money on meat. Zaycon Fresh was founded in 2009 and is a privately owned company based in Spokane, Washington. The company partners with farmers to deliver fresh meat and seafood to 1,200 locations nationwide. Because the customer picks up their own meat, and cleans and packages it on their own, the “middleman” is cut out of the process. As a result Zaycon Fresh can offer meat to the customer at a wholesale price. Also, Zaycon Fresh offers more than just chicken breasts. Their line of meat products is ever expanding and includes strip steak, shrimp, lobster tails, lean ground turkey, Polish Kielbasa sausages, 100% beef hot dogs and more. I ordered from Zaycon Fresh in March (my order was just under $70, at $1.69 per pound). I just placed another order for October (this order was just under $60, at $1.59 per pound). By buying in bulk, I am able to save money on meat. 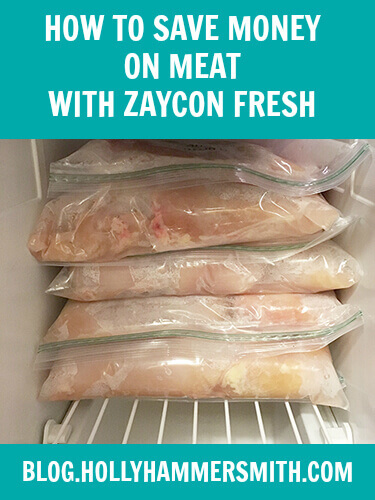 Prior to discovering Zaycon Fresh, I was paying as much as $3.99 per pound for all-natural chicken breasts. Paying $18 to $20 every month for only a handful of breasts adds up. And going to the grocery store frequently, with an infant in tow, is not how I would like to spend my time. Buying meat in bulk may not be for everyone. You will have to weigh your time, resources and wallet on this one. You save money on meat. Zaycon Fresh chicken breasts go on sale for as low as $1.49 per pound. You will finish your meat shopping in one trip and won’t have to shop again for several weeks, or months. Our March order lasted through July. The 40-pound box had roughly 40 breasts. I froze the breasts 4 per bag and had 10 bags stacked in our freezer. I used the chicken breasts for homemade chicken nuggets, on our George Foreman Grill for salads and as chunks for crock pot meals. Zaycon Fresh chicken breasts are 100% natural with no added hormones, additives or artificial ingredients. In terms of quality of the cuts I was pleased. There was some minimal cleaning to do, trimming of fat and removing a few bruised sections. The breasts were also very large – bigger than my hand! Ordering is quick and easy. Just select a pickup date, your desired product and pay online. When you order from Zaycon Fresh you have the option of volunteering at pickup. If you volunteer you will get $10 per hour in credit back to your account to use toward future purchases. If your freezer is small, or already full, you may not have enough room to store 40 pounds of chicken. You may consider buying a chest freezer for bulk purchases. You will spend time picking up your order from Zaycon Fresh. When you place your order you can search by zip code to select your pickup location, date and time. The location closest to me was about 7 miles away, which wasn’t horrible. You will need to clean and store the meat yourself. I picked our order up at 10 a.m. on a Saturday and cleaned it that afternoon. 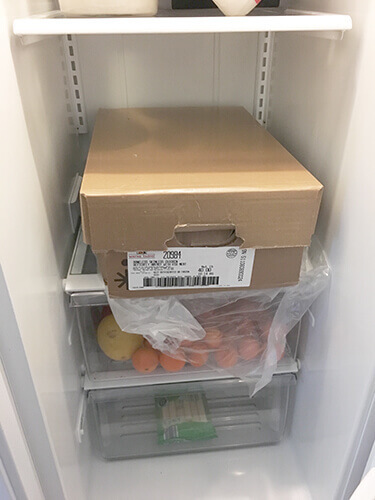 Our 40-pound case did fit in our refrigerator which offered some leeway in preparation time. With two adults it took us about an hour. Instead of cutting the meat prior to freezing, I froze the breasts whole, which saved time. Forty pounds may be more than you would like to purchase. If your household is small, consider splitting your order with a friend. Overall I have been happy with Zaycon Fresh, and as I mentioned at the beginning of my post, I just placed another order for chicken breasts. 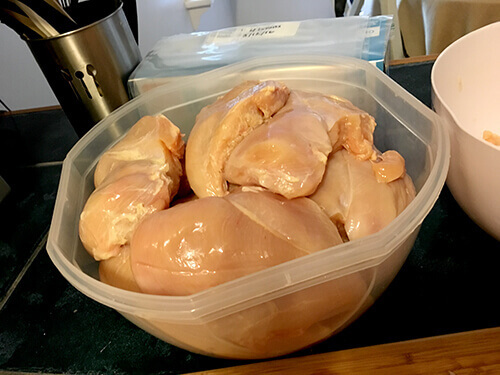 Buying chicken in bulk takes the stress out of shopping and allows me to save money on meat and lower my grocery bill at the same time. If you are tired of making multiple trips to the grocery store and are ready to save money on meat, consider ordering from Zaycon Fresh. Buying in bulk is ideal for large and growing families and those who like to meal plan. Bummer. Maybe you can write them and let them know. It would be wonderful if they brought it back to your area!